Marco Wittmann wins the 2014 Drivers’ Championship in the BMW M4 DTM to make history at the Lausitzring. Lausitzring (DE), 14th September 2014 - The DTM has a new champion: Marco Wittmann (DE) of BMW Team RMG wrapped up the title in the Drivers’ Championship in the eighth round of the ten-race season at the Lausitzring (DE). Sixth place on Sunday was sufficient for the 24-year-old, at the wheel of the Ice-Watch BMW M4 DTM, to ensure he can no longer be caught by his rivals. Wittmann started from seventh place, and once again produced a flawless race in difficult conditions to pick up eight points at the end of the 52-lap race and take the final step towards the title. Wittmann follows in the footsteps of Volker Strycek (DE, 1984), Eric van de Poele (BE, 1987), Roberto Ravaglia (IT, 1989) and Bruno Spengler (CA, 2012), who have all triumphed in this series for BMW. Taking all manufacturers into consideration, he is the third-youngest DTM champion of all time. Wittmann’s success also marks the first time in the history of the “new” DTM – since 2000 – that a driver has been crowned champion in only his second year. Only Bernd Schneider (DE) had previously managed to secure the title three races before the end of the season back in 2001. In winning the title, Wittmann continued a special tradition: whenever BMW has appeared in the DTM with a new model, the title in the Drivers’ Championship has ultimately gone to Munich (DE) at the end of the season. After Strycek’s success with the BMW 635 CSi in 1984, van de Poele repeated the feat with the BMW M3 in 1987, and Spengler continued the tradition with the BMW M3 DTM in 2012. Wittmann has now ensured that the first year of the new BMW M4 DTM will also go down as a golden debut season. He now has 128 points to his name, and a 69-point lead over second-placed Christian Vietoris (DE, Mercedes). BMW Team RMG also tops the Team standings with 167 points, giving it a 75-point cushion ahead of its closest rivals. And BMW also leads the Manufacturers’ Championship with 320 points. 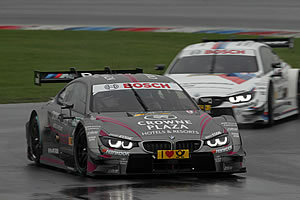 Behind the new champion, Augusto Farfus (BR, Castrol EDGE BMW M4 DTM) and Martin Tomczyk (DE, BMW M Performance Parts M4 DTM) also finished in the points in seventh and eighth at the Lausitzring. Both drivers were rewarded for fighting back strongly from 20th and 23rd on the grid respectively. Joey Hand (US, Crowne Plaza Hotels BMW M4 DTM), Maxime Martin (BE, SAMSUNG BMW M4 DTM) and Bruno Spengler (CA, BMW Bank M4 DTM) came home 11th, 14th and 15th. The two BMW Team MTEK drivers, Timo Glock (DE, DEUTSCHE POST BMW M4 DTM) and António Félix da Costa (PT, Red Bull BMW M4 DTM), failed to finish. Victory at the 3.478-kilometre circuit went to Mercedes driver Pascal Wehrlein (DE). Wittmann can now enjoy the remaining races in Zandvoort (NL) and Hockenheim (DE) as the DTM champion. The young German caught the eye in the very first race of the year, winning the season-opener at the Hockenheimring – and he went on to add a further three victories over the course of the season. At just 24 years and 294 days, Wittmann is the youngest DTM champion in BMW colours, and the youngest ever champion from Germany.